Maybe you are wondering, "What is a native plant? Where can I see one? Can I grow one? Why are people working for their protection?" San Diegans can start from the ground up with CNPS. You can invite our volunteers to set up our informative and colorful professional exhibit at your school, library, or office building for two to four weeks. If you are involved with a one-day event like a trail cleanup, outdoor run, environmental fair, or gardening expo, a volunteer could set up the display for that one special day. The exhibit and the handouts may introduce you and your peers to many seasons of outdoor enjoyment of our County's rich native plant legacy. Volunteers may also be able to answer to specific native-plant-related questions. The CNPS volunteer may help you contact professionals who have expertise in native plants for consultations or other services involving conservation, restoration, landscaping, or development issues. Please email publicoutreach@cnpssd.org for more information. 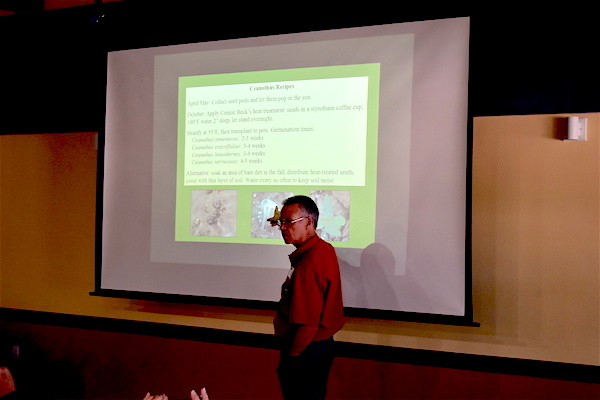 CNPS volunteers can present slide programs to groups of ten or more viewers. The programs run around one hour including time for questions. • "San Diego's Native Plant Landscapes -- Designing Places with Native Plants" -- a good choice for a homeowners association or garden club interested in saving or replanting native plants. • "A Sense of Place -- Native Plant Habitats of San Diego County." -- excellent for a scout troop working on an environmental badge or a hiking group wanting to learn more about the natural environment of San Diego County. Our local chapter has a library of reference books available to members. These books may be checked out during our monthly meetings on the third Tuesday of each month. A list of titles is available for download.